Is there anything better than following a bite of chocolate with a sip of good red wine? We think not. Celebrate two of the best things in life with good friends, family, or that special someone. Join seven of our Washington State Wineries on the North Olympic Peninsula for two weekends of Red Wine and Chocolate: February 12 – 13, and February 19 – 21, 2011 (11 a.m. to 5 p.m. daily). The chocolate fountain will be flowing at FairWinds Winery in Port Townsend. There will be chocolate dipped wine glasses at Olympic Cellars in Port Angeles; and all of their Washington State Wines will be poured during Red Wine and Chocolate. Start with the recommended chocolate and wine pairings, then try whatever catches your fancy. Enjoy chocolate by local chocolatiers Yvonne Yokota (Yvonne’s Chocolates) and Jim Queen (Chocolate Serenade). The beauty of the Olympic Peninsula is unparalleled. The pairing of water and mountains is exceptional, as is the pairing of red wine and chocolate. Give yourself over to decadence on the Olympic Peninsula: attend our Red Wine and Chocolate Weekends, February 12 – 13, and 19 – 21, 2011. 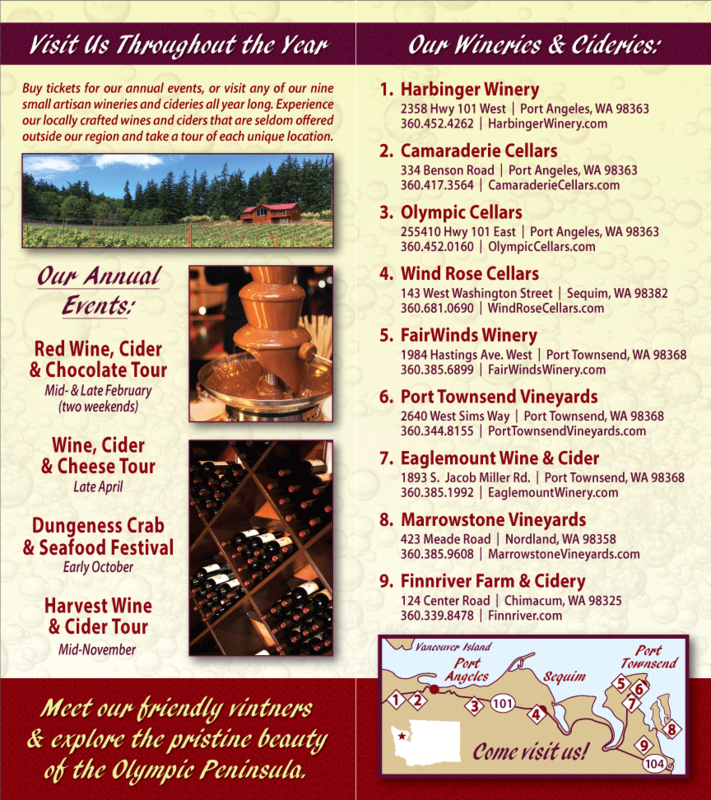 Please see our Olympic Peninsula Wineries Events page for more details.